Inspired by a Cheese Log that my mom used to make in the 70’s with processed cheese food and chili powder. Mix Chili Powder and Cumin in a bowl. Set aside. In another bowl, mix together cheeses, butter lime juice and Slap Ya Mama. Form into a ball. Roll in to chili powder and Cumin mixture. Sprinkle with lime zest and serve with corn chips. Here's the new recipe using the cave man club sized yellow squash.... zuchini can be used also. Pierce squash all over with fork and microwave on high for 3 minutes, or until they are softened but still firm. Allow to cool slightly, then slice in half lengthwise and scoop out the insides,(please use a potholder here, these babies are HOT) leaving as much along the sides as you can, discard seeds and stringy innards. sprinkle insides with 1/3 Tablespoon SYM seasoning and set aside. In large skillet, brown the ground beef (you may also use turkey or a combo of beef and sausage) drain well. In same skillet that you browned the meat, place, diced onion, garlic, pepper, mushrooms and 1/3 Tablespoon SYM, saute until mushrooms are browned and veggies are tender, add spinach and corn and cook until wilted, then throw in the meat and stir until well combined. Stir in tomato sauce and simmer for about 15 minutes to let everything work together. 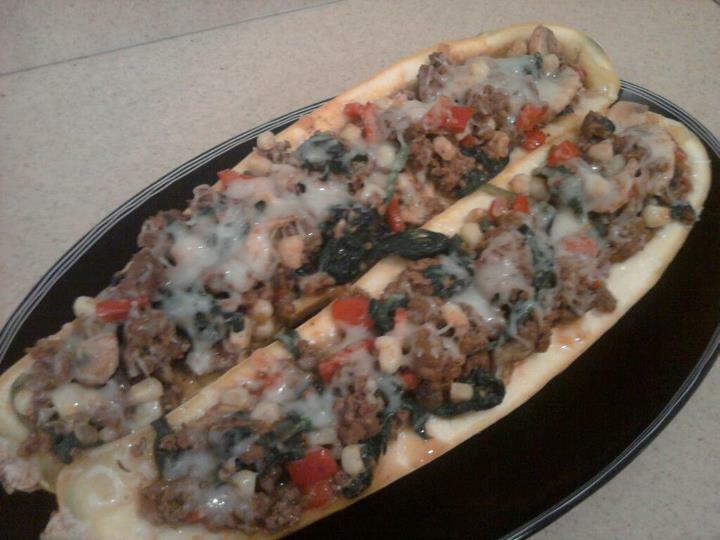 Fill Squash boats with meat and veggie mixture, top with cheese and last 1/3 Tablespoon of SYM. Bake in oven for 30 minutes, covered until squash is cooked through and tender and cheese is melted/bubbly. 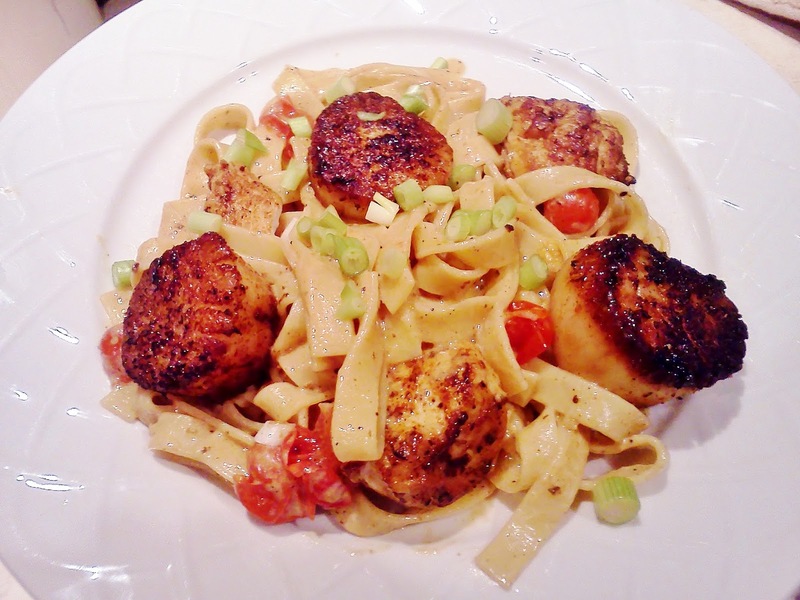 This is a great carb free meal, and a good way to use up leftover veggies. Why doesn’t everyone make something as simple as eggs benedict for breakfast? I’ll tell you why…because people make it sound so difficult with specific recipes for poaching eggs, specific recipes for a hollandaise sauce, and use only this or do only that. Horsefeathers! And I’m not talking about a bar in North Conway, NH either. You don’t need pots of simmering water with vinegar, ice baths or even Granny Nusebaums secret hollandaise recipe that requires gladiator sweat and a newt’s ear. You need only a good sized non-stick sauté pan/ skillet with a lid, a toaster, a blender and a small sauce pan along with some common sense. 1 Lemon……so put the plastic lemon away and go get a real one…I’ll wait. 2 slices of good sourdough or 1 English muffin split. In a large (12-14inch) non-stick sauté pan over medium low heat add 1 Tablespoon of butter and allow it to melt. Once it has melted add your two eggs gently into the pan and on the other side of the pan add your ham. If you are using bacon or sausage cook those separately and hold and cover to keep warm. Once the eggs have started to set you may move them around for a bit just to loosen from the bottom of the pan, then flip your ham and cover again. This should take about 4-6 minutes to get perfectly cooked sunny side up eggs. If you prefer them over easy… go ahead and do so but make sure the yolk stays runny. While you start cooking your eggs, go ahead and toast that bread or English muffin because this is all going to come together pretty quickly. At the same time you start making your eggs…over medium heat add a stick of butter and the juice of one lemon to the small sauce pan plus a couple of grinds of black pepper and that pinch of kosher salt…let it heat up until it hits a high simmer (just before boiling) and at this time put your three yolks into the blender plus a pinch of Slap Ya Mama seasoning. Lay your toast in the plate side by each as they say here in New Hampshire. Lay the ham on top of the toast. Put your perfectly or not so perfectly cooked eggs on top of the ham. Turn the blender on low or high…it doesn’t matter which and slowly drizzle your hot butter/lemon mixture in until gone…let mix for a few seconds and Voila…cheating hollandaise. Pour a la Jackson Pollock style on top of your eggs and sprinkle the remaining SYM seasoning on top for Pavlov’s SYM Benedict. Don’t stress about breakfast…stress about how to tell your husband you broke his nine iron digging a rock out of the flower bed. Or how you’re gonna explain to your wife that you’re pretty sure that pink color will come out of her white cashmere sweater that is now 4 sizes smaller than she is. Tell me…how do you Benedict? Love to hear from you! My husband says this is the best oven-fried chicken I have ever made! Combine flour and SYM seasoning in a big Ziploc bag. Coat chicken pieces by shaking them in the flour mixture. Place floured chicken pieces on a plate and sprinkle both sides with a little more SYM seasoning. Put butter in 13x9x2 inch pan and pop in the oven until it melts. Place chicken pieces, skin side down, in pan. Bake, uncovered, for 30 minutes. Turn chicken over and bake until thickest pieces are done, about 30 more minutes. In a saucepan melt butter over medium heat. Add flour, and whisk for about a minute. Slowly pour in chicken broth and milk (keep whisking) and then add the Slap Ya Mama seasoning. Continue cooking over medium heat until thickened. When chicken is done you can add some drippings if desired. 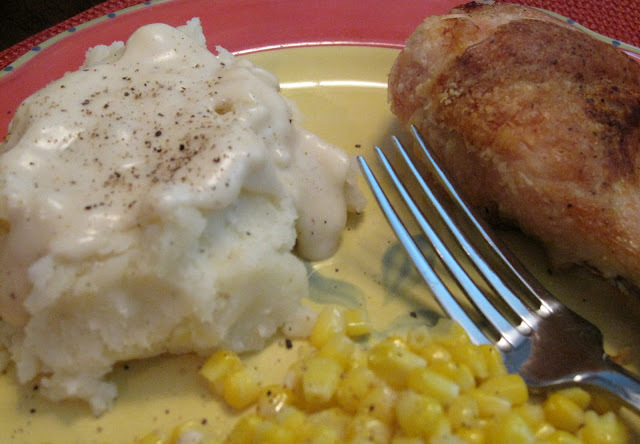 Serve over mashed potatoes or biscuits and enjoy! 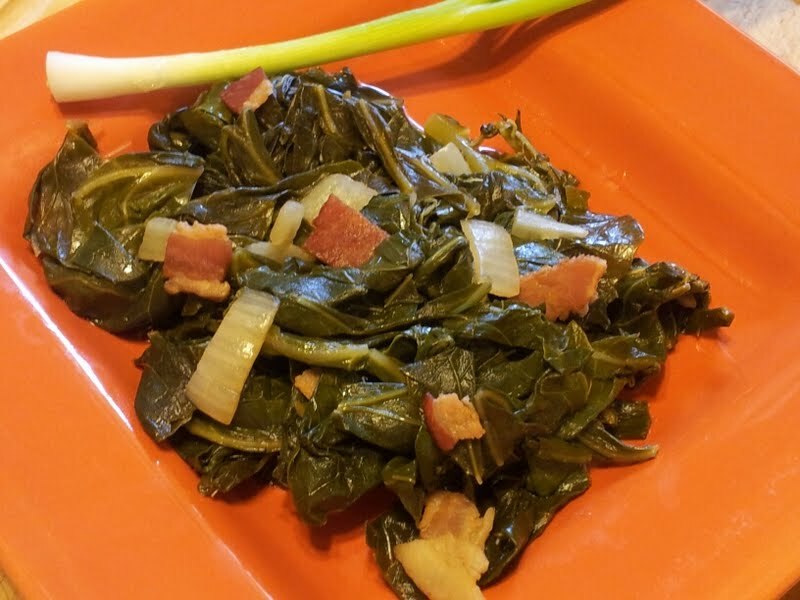 Rinse and take collards off the stems. In a large stockpot start bacon on medium heat. Add onions and seasoning. Let them mingle for a little while. Add stock and turn up the heat to bring to a simmer. Add the greens and let them simmer down. Stir about halfway through. Let cook about 30 minutes and check for seasoning. Add more Slap Ya Mama or salt and pepper. Cook until tender. Preheat oven or grill to 300. Slice Jalapenos in half lengthwise, remove seeds and veins. Mix together Cheeses and SYM. Fill Jalapenos with Filling , and close them back together.Wrap Each Jalapeno with bacon. Place on Broiler pan or grill and slow cook until bacon is crispy about 2 hours. I live at high altitude and they took about 2.5 hours in the oven. I think cooking them on the grill goes a bit faster. You may have to adjust the temperature or time depending on where you live. These take awhile to cook but are worth the wait! Mix together Slap Ya Mama seasoning, olive oil and lime zest, then toss in shrimp, cover and marinate overnight. 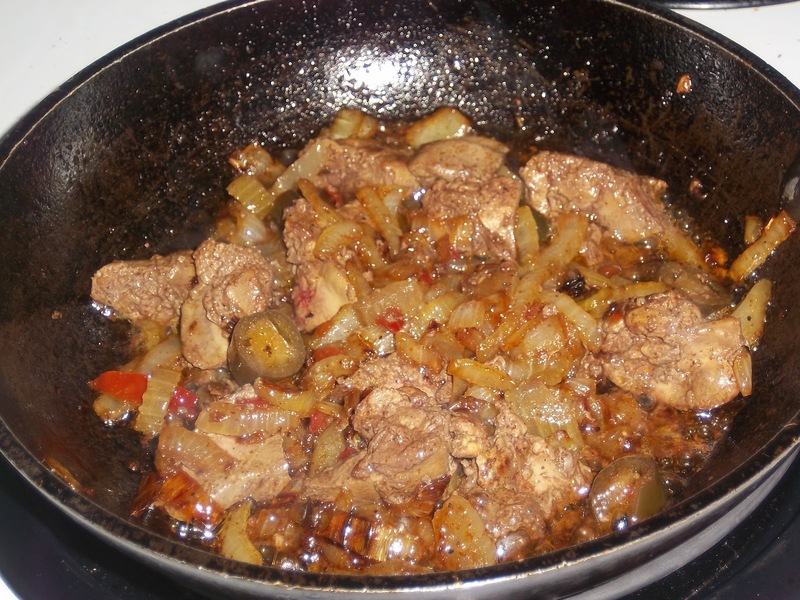 Sautee in a pan with 1 Tablespoon olive oil. Bring water and garlic to a boil in a heavy saucepan, then stir in salt and cornmeal. Cook on low, stirring often, until mixture is thick (approx 15 minutes). Remove from heat, stir in butter and coriander, and add black pepper to taste. Transfer to a 8"x8" nonstick baking pan and let cool for 1/2 hour, then place a sheet of cling wrap on top and smooth out the surface so that it is even. Chill thoroughly in fridge. Turn out well-chilled polenta onto a cutting board and cut into 16 squares. 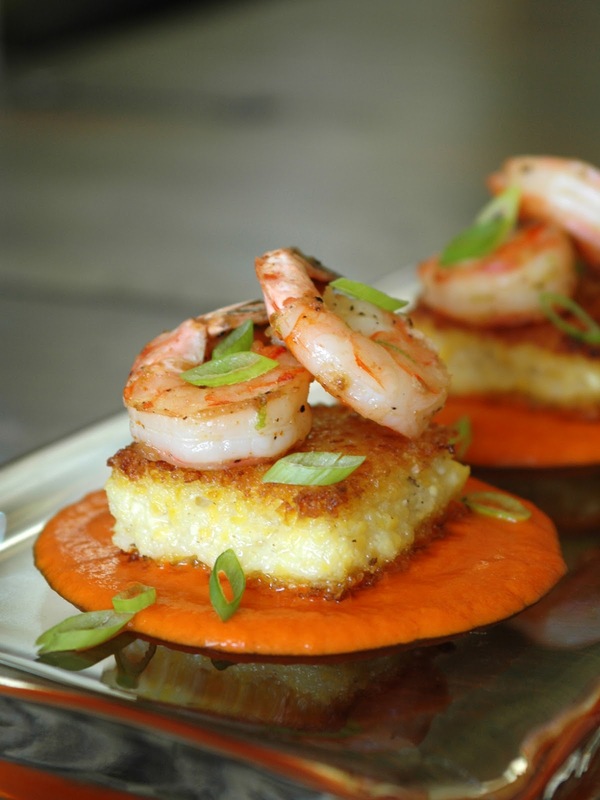 Heat 3 Tablespoons olive oil in a nonstick pan on medium-high heat, then sear polenta for 5-6 minutes on each side. Turn your oven broiler to high with a rack in the middle of the oven. Wash the peppers, cut out the core, then halve and remove the seeds and ribs. Flatten slightly, skin side up, on a baking sheet. Brush with 1 tbsp olive oil, and broil until the skins blister and blacken, rotating if necessary. Remove peppers from oven, transfer to a bowl and cover for 15 minutes to steam and soften them. Peel off the skin with a knife (they should slip off easily). Puree peppers and all other ingredients in a blender, then strain through a fine mesh sieve. Spoon a few teaspoons of red pepper coulis onto a plate. Place a piece of polenta in the middle, then top with two pieces of shrimp. 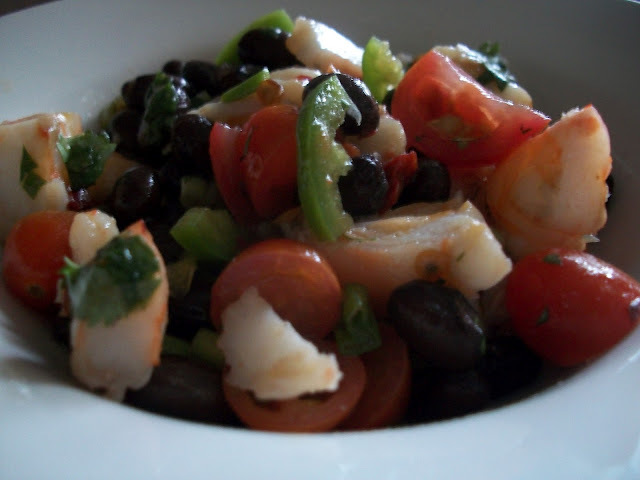 Garnish with sliced green onions and serve. This is a modification of my mom's recipe. Of course, mine never turn out quite like hers! I decided to try this to see if SYM was versatile enough to use in Asian dishes. And it is! The long cooking time seemed to mellow out the heat, leaving just a hint of warmth, thus the suggestion to use some sriracha at the table to re-ignite the fire! I might try adding some SYM Hot during the basting period next time. Preheat oven to 325 degrees. Rinse ribs and pat dry with paper towels. Set aside. Combine soy sauce and next 10 ingredients in a bowl. Combine half of marinade with honey and set aside. 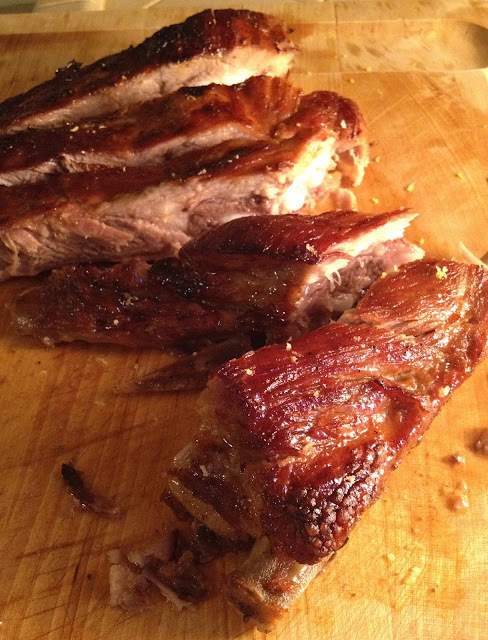 Lay ribs in double layer of aluminum foil in shallow baking pan. Pour remaining marinade over ribs, rubbing all over to coat well. Wrap tightly in foil. Bake ribs for 1 1/2 hours. Carefully open foil packet and baste ribs with reserved honey-marinade mixture. Continue baking for 30 minutes. Baste again, then turn on broiler to 400 degrees. Cook for another 30 minutes or until tender and caramelized, basting every 10 minutes, taking care not to let the ribs burn. Remove from oven, let rest 10 minutes, and cut into individual ribs. Serve with sriracha and/or additional hoisin sauce, if desired. I'm not much for eatin' out, cause I know I can cook a helluva lot better meal than what I can get out. This also applies to take out food, except for Chinese food. Nothin' beats Chinese take out. Anyway, I worked a little late today and wanted somethin' simple and quick for dinner. So I foraged through the fridge and I decided a 'clean out the fridge' meal was in order. I just used what I had on hand, as most all of it was already cooked. All I hadda do was chop it up. I used my wok to cook this just cause I feel so cool when wokking!!! Saute the onions over high heat till slightly charred, remove and do the same with the corn. Remove and do the same with the sausage. Remove. Add half the onion/corn/sausage mixture to the wok, turn the heat down to medium and add 2 eggs. Cook till crispy and then flip and add as much HOT SYM seasoning as you like. 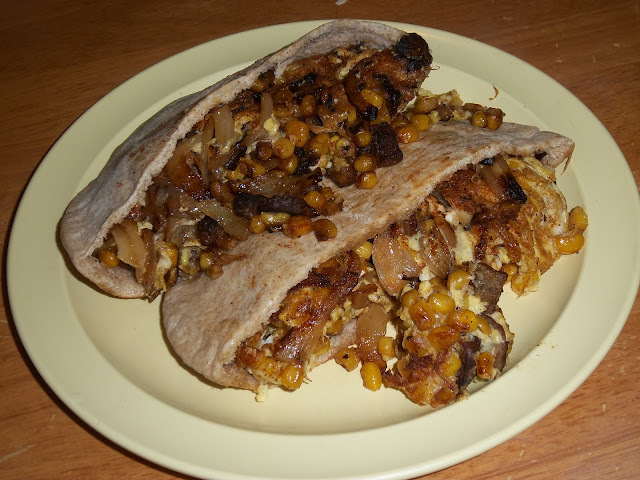 Slice a pita in half, set in in the wok, touching the sides of the pan so it heats up as the eggs are finishing cooking. Fill pita and "wok" out! P.S. Use the other half of the onion mixture and the other 2 eggs to make your better half dinner, too!!! Slap Ya Mama seasonings, brown sugar, garlic cloves, oregano, olive oil, and vinegar. so it would stay moist. 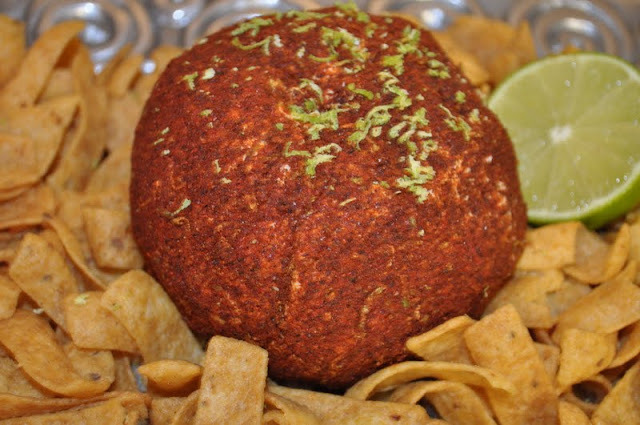 without squeezing fresh lime wedges over the top! Enjoy! When I was growing up, we would visit my cousins, who lived in the middle of a peach farm. They would rise very early to tend to their crop. The Noon Meal was a big meal, always consisting of peas & tomatoes they grew on their farm. Roast or chicken, a skillet of cornbread and some kind of dessert made from the peaches. This may be strange to some, but they always topped their peas and tomatoes with mayonnaise. This was the inspriration for my salad, enjoy! Place peas, SYM and bacon in a pot, pour in enough broth to cover peas, bring to boil, then reduce heat to low and continue to cook until peas are tender, occasionally stirring and adding more broth. (Cooks in about 1 hour). cool and drain peas. Cover a cookie sheet with foil. Place your bacon on the cookie sheet, sprinkle each piece with pecans, then Slap Ya Mama and brown sugar. Place in oven at 400 degrees. Bake until crispy, about 15 minutes (carefully watch so you don’t burn it). Make your favorite cornbread recipe. (Add 1 teaspoon of Slap Ya Mama to batter). You will need about 2 cups, cubed. 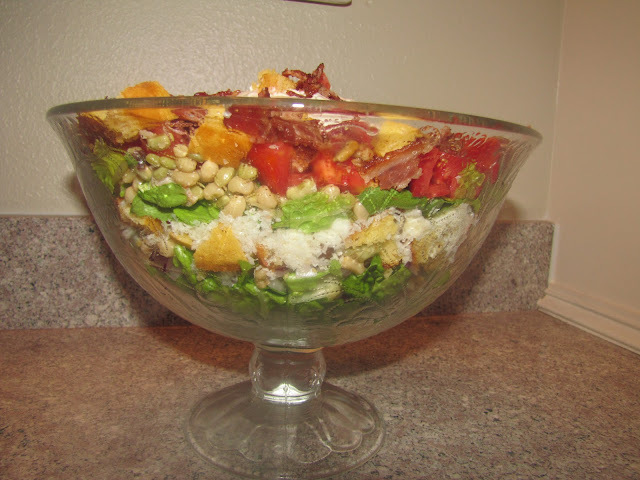 Start with 2 cups lettuce on bottom, 2nd layer - 1 cup peas, 3rd layer - red onion, 4th layer - 1 cup cornbread, 5th layer - shredded cheese, 6th layer - 1 cup lettuce, 7th layer - 1 cup peas, 8th layer - tomatoes, 9thlayer - 1 cup cornbread, 10th layer - bacon/pecans. 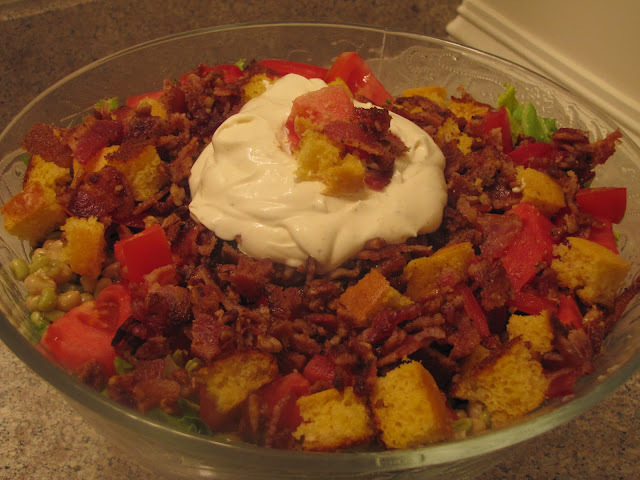 Place a big dollop of the mayo/sour cream dressing on top (reserve rest). Garnish with bacon, tomato and cornbread cubes. When ready to serve, toss together, adding additional dressing until desired consistency. Saute onion in butter and remember the more butter ya use the better it's gonna be! Add giardiniera, SYM and saute till giardiniera is done to your liking. 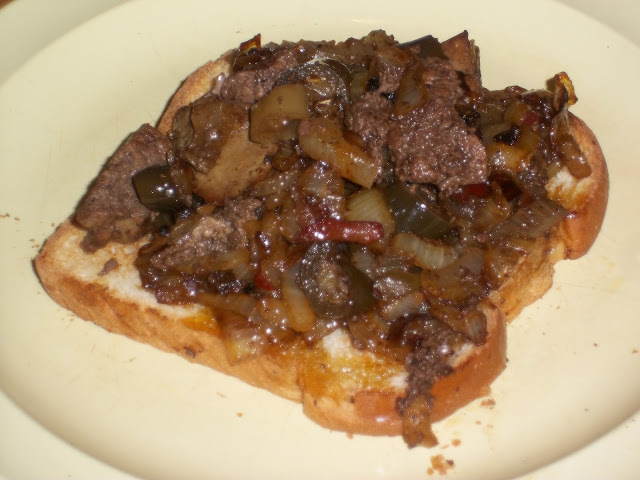 Take onion and giardiniera out of pan and saute livers till still a little pink in center. Carefully add the Jack Daniels and onion mixture and cook till the whiskey evaporates. I like to eat this on toast points! Season water with Slap Ya Mama seasoning. Bring to a boil. 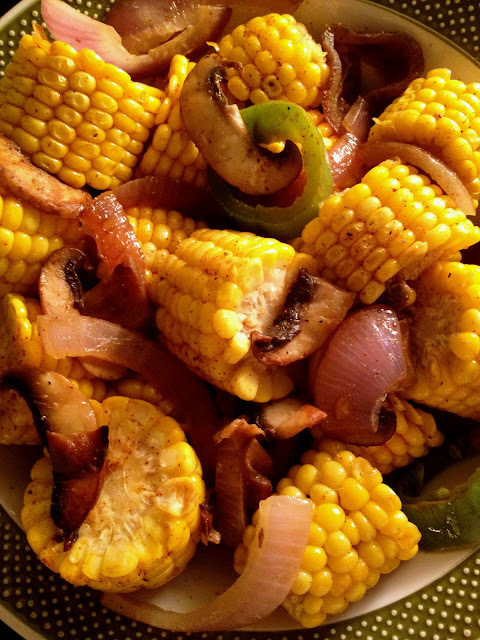 Add corn, return to boil and cook until kernels are just tender, about 2 minutes. Drain corn and set aside. In a medium stock pot or dutch oven, heat olive oil and butter over medium high heat. Add onion, bay leaf, and mushrooms; stir and cook 1 minute. Add garlic, jalapeno, and corn, tossing to coat. Cook for 2 minutes, stirring occasionally, until corn browns slightly and vegetables begin to wilt. Add chicken broth, bring to a boil and cover. Steam for 1 minute. Remove cover and reduce liquid slightly. Drizzle with honey or nectar; toss to coat. Sprinkle liberally with Slap Ya Mama Hot seasoning. Toss and season again, if desired. Season 2 quart waters with SYM seasoning and bring to a boil. Add shrimp, reduce heat, and cook until shrimp are pink and firm. Cool shrimp, and cut into 1/2” pieces. 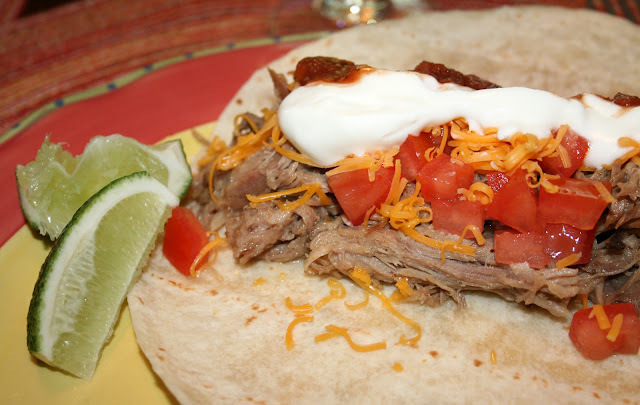 Serve with tortilla chips or fresh corn tortillas. Cover and refrigerate for up to 1 day. I prepped my garnishes first. 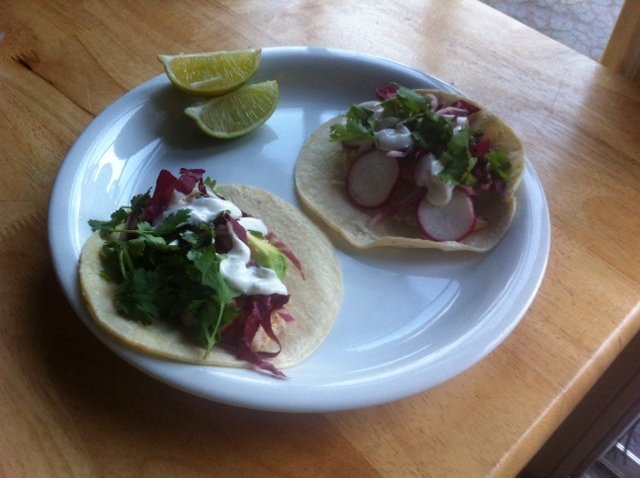 For my fish tacos, I used cilantro, thinly sliced red onion, sliced avocado, radicchio and radishes (I used my mandoline). I also made a topping of sour cream, lime juice and a healthy sprinkle of Slap Ya Mama HOT. I let the sour cream mix sit for about 1/2 hour before I assembled my tacos. I prepped enough garnishes for 1, so make enough for the amount you're cooking for. I had enough leftover for another whole meal for myself, at least. Sprinkle the fish with the Slap Ya Mama HOT seasoning. Heat a pan to medium-hot heat then drizzle a bit of olive oil in it. Pan fry the fish for a few minutes on each side, remove from pan. Heat up corn tortillas 20-30 seconds on each side on a skillet. Let fish sit a few minutes. 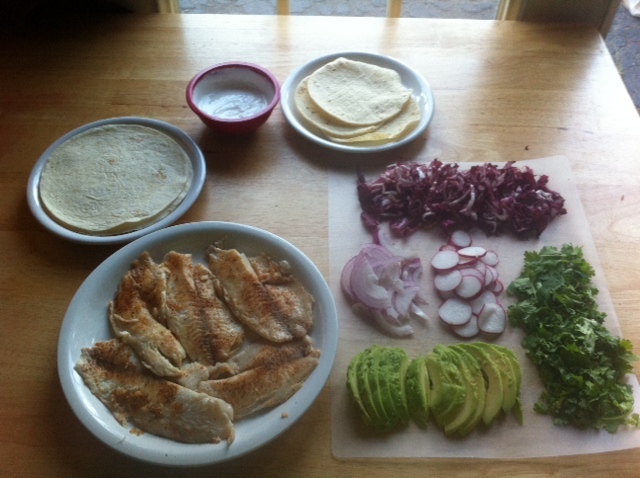 I chose not to flake the fish, and used about 1/2 a piece per taco. Assemble your tacos with the fish and garnishes as you please! Remove the skin from the turkey thigh and remove the meat from the bone. Cut the meat into bite-size pieces and toss them into a bowl. Chop the egg roughly and add it to the bowl. Dice the green and red bell pepper and add them to the bowl. Chop the olives roughly - if you make sure you cut each one at least in half, you'll be sure that there are no pits remaining in the olives. Even if your olives are supposed to be pitted, there's a chance you'll find a few pits - so chop them and make sure you get rid of any pits that snuck through the process. Add the mayonnaise and the Slap Ya Mama seasoning to the bowl and stir to combine. Taste for seasoning and add more Slap Ya Mama if desired. Add salt, if needed. 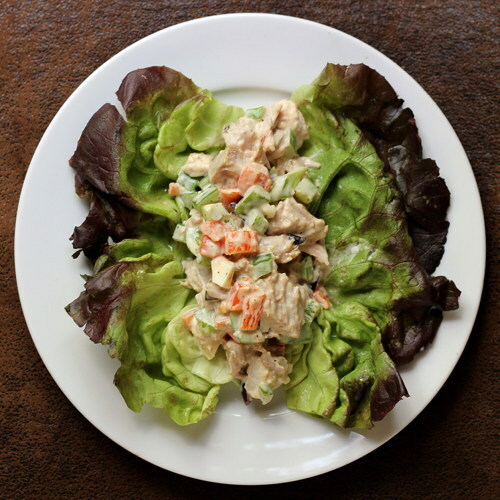 Serve on a lettuce leaf or use this as a sandwich filling. Or use it to stuff an avocado.